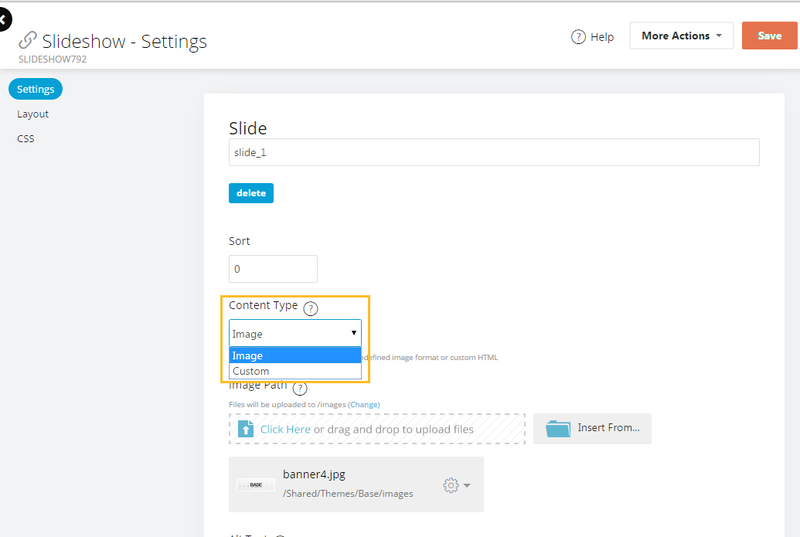 In setting up the slideshow widget, first you’ll need to add the widget to the area you want it to display. This can be done in live design or in your store admin. The default area for the slideshow widget is in “Home Page Header Widgets” area on the home page. This area will set it on the home page, above the left and right columns. Otherwise you can place it at the top of the home page, so it will span between the columns. Click the widget icon to view the widgets. Go to the “Home Page Header Widgets” area and add a widget. If one is already there, hover over it and click the settings icon. Go to the widget area of the Home page (selected from the left column). Click on Add Widget to the HomePageHeaderWidgets section, select the Slideshow Widget. After it loads click the settings icon. After you have opened up the widget you’ll see a lot of different fields to customize the slideshow. First you'll want to set the size of the slideshow. 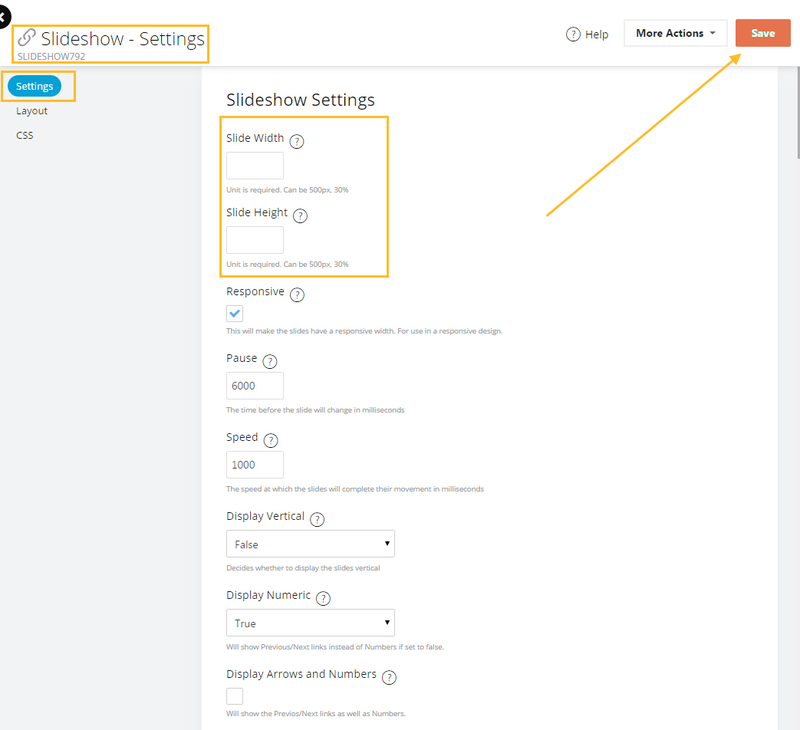 Scroll down to Slideshow Settings and set the height and width of the slideshow. This setting will not affect the size of your images. If your images are larger than these dimensions, they will be cropped. So if your images are cut in half, it is most likely this height and width that needs to be corrected. After this scroll down to “Slides” section. If there are no slides, click the “Add New Slide” button. and....????? can you add more than 3? any more settings with how it flashes across?? PLEASE? My version of Americommerce looks nothing like the screen shots in this article. My version is 2012.5.1128.8 and it doesn't even have "widget". I found the Carousel in the Snap-in list but it only gives me choices for products, not images to upload or HTML pages. Please point me to a better tutorial for adding a slideshow/carousel of images and/or HTML. Thanks. @Victoria: Yes you can add more than 3, simply click the New button above the existing slides and it will add another slide. 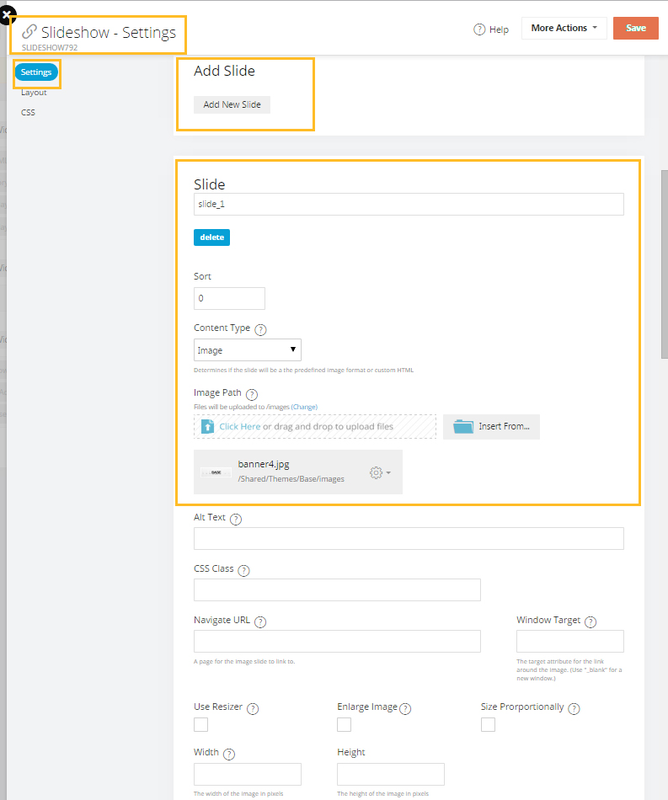 If you are having the same problem I mentioned above (article not matching your back-end), you are using the the old v1 theme system and need to ask Americommerce about an upgrade. @Shane, actually there is no need to ask for an upgrade as all sites on AmeriCommerce have had access to the v2 theme system for well over a year. If you're interested, I'd say just dive right in! Exactly my thoughts. Would be nice to get more info on the topic. If the original article was helpful to you, bless your soul. I love the Re-Sizer. It shines when you resize your browser. Actually, no it doesn't. It'd be nice if an admin looked at the questions on the articles they write in a timely manner. Sorry for the sarcasm and negativity. Sorry that the article needs more information. The reason there isn't a set image resolution of how large the images need to be, is because this varies by theme. There is no "set" size. Several people will make the image they want first with a rectangular resolution size large enough to fit a widescreen wallpaper, edit it in a photo software such as Photoshop, and then upload it. You can also edit your CSS to change the size of the slideshow widget itself by finding this widget and changing the size under the slideshow settings to fit your image of your choice. We are currently in the works of transitioning our articles to update them with more information. Let us know if you have any further questions or need further assistance. Why not just give the size for each template somewhere? DONE. I just spent over an hour trying to resize ONE dadgum picture.... and it's still not right! Resizer check box doesn't work. Enlarge image check box doesn't work. Resize function in pic edit doesn't work. Is there anyway to alternate the direction the slide moves, right to left as opposed to left to right?